Have 23' 2x9 d-fir ceiling joists in my garage. The joists are braced with plywood that runs the length of the garage. 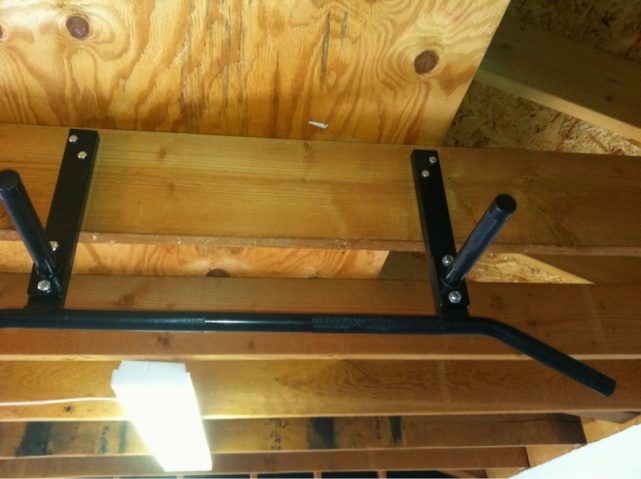 I recently installed the pull up bar (pic below) using 3/8" bolts with cut washers and nuts. I weigh approximately 208lbs. I was thinking that I might add an additional 2x6 brace from the joist to the truss above on the right side of the pull up bar. Any thoughts / suggestions on how to do so would be appreciated. 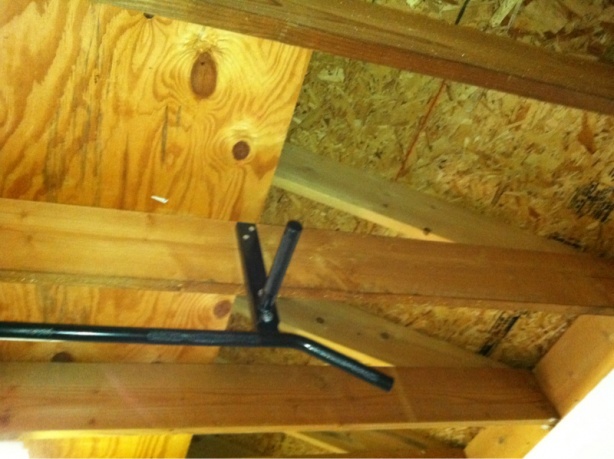 I would attach a 2x on top the joists, run perpendicular to the joist/rafter, then attach the bar to that. You would be distributing any weight on two different joists and not have the tipping load as there is now. Why not bridging between the rafters to reduce tipping instead of moving the bar? How much joist deflection do you get when you yank yourself up? How 'bout when you're just hanging there? The deflection when i pull up is noticeable, but doesnt seem severe.